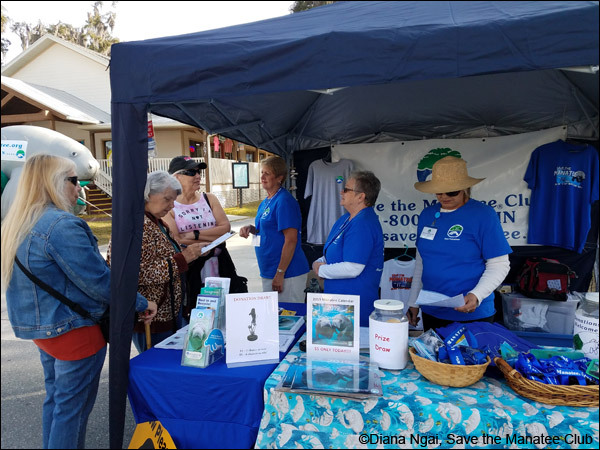 Volunteers staff the Save the Manatee booth — a place where you can chat about your favorite manatee viewing spots, learn new and exciting facts, and of course Adopt-A-Manatee. Fresh-squeezed lemonade and hot kettle corn, whimsically-colored artwork, and the soft splashes of floppy manatee flippers — who could ask for more from their weekend? These are the sights and sounds to be found at the 32nd Annual Florida Manatee Festival and nearby Three Sisters Springs National Wildlife Refuge in Crystal River, Florida. 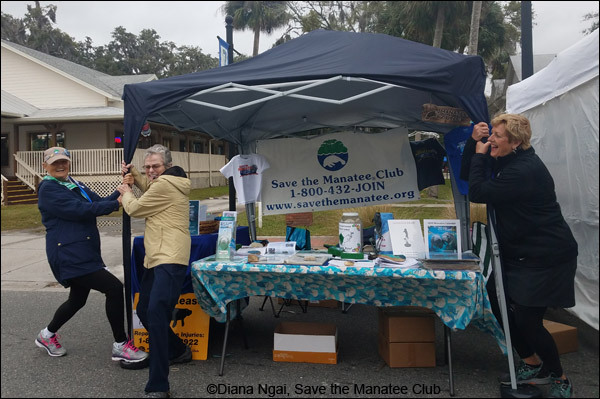 Staff and volunteers from Save the Manatee Club (SMC) are always excited to join the festivities. Saturday, when it was warm and sunny, we had people from all around Florida and visitors from elsewhere streaming through the festival. 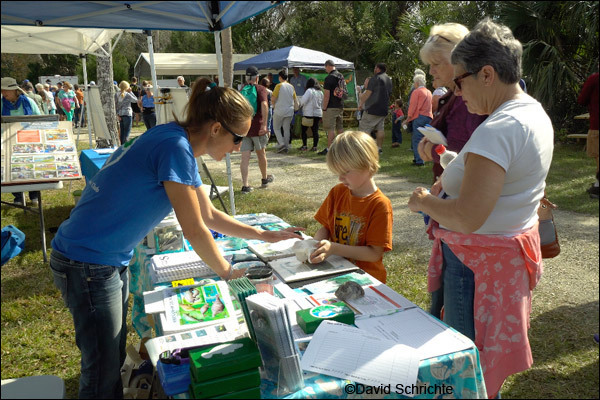 Many stopped to chat at length about their SMC adopted manatee or experiences with manatees. New and existing Save the Manatee Club members came over to Adopt-A-Manatee® for themselves or a friend. Our stunning and ever-popular calendar (think Sports Illustrated but with manatees) and other donation items flew off the table. Even though Helen Spivey, Save the Manatee Club Board of Directors’ Co-Chair, sent up-to-the-minute weather reports, we were still somehow unprepared for the drastic change in weekend weather. When the chilly wind whipped up on Sunday, the clouds thickened, and the crowds thinned. Cold weather in Florida isn’t always bad news (although shivering locals might tell you otherwise). The plummeting temperatures meant more manatees seeking refuge in the nearby warm water at Three Sisters Springs. The festival provides a free shuttle service to and from the springs, so many people who braved the cooler weather made a stop at our booth first. We could see the dedicated festival and manatee lovers who trickled through the entrances. Although we didn’t lose hope, our inflatable manatee named “Hope” stayed safely stowed away. As they passed the SMC booth, these brave souls withdrew their hands from coat pockets to slip a few dollars into our donation jar or to reach out for a free poster of a manatee floating in clear water — a reminder of peace and warmth in the world. Whatever the weather, Florida manatees and the Crystal River manatee festival are well loved by many. Our SMC staff and volunteers will continue to raise funds and awareness to protect our beloved manatees. We hope to see you all there next year! Thank you to the wonderful volunteers at this event: Cora Berchem, Trinket Mason, Melissa Sunshine, Kelly Miller, Mary Bourassa, Stephanie D’Amico, Steven D’Amico, Jozette Spina, Janneke Bogyo, Sue Carey Lindholm, and new volunteer Bob Fowler. A special shout out to photographer David Schrichte, who stopped by and assisted at the Three Sisters Springs table. Unflustered by the blustery wind, SMC volunteers (l-r) Janneke Bogyo, Sue Carey Lindholm, and Trinket Mason hold onto the newly-donated tent at the Citrus Avenue location. They jokingly pose as if it the tent might fly into the sky like Dorothy’s house in the Wizard of Oz – which it did just moments before. 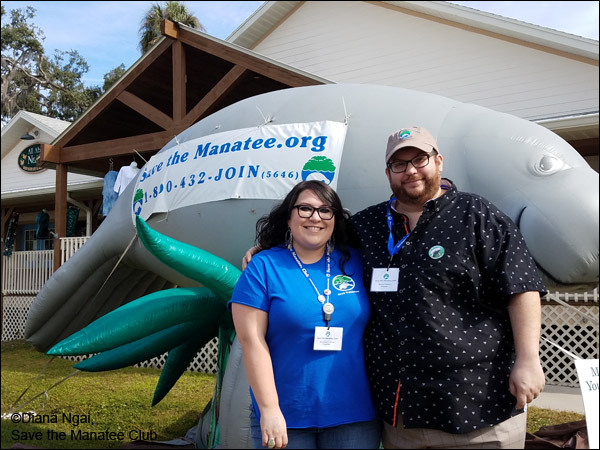 Save the Manatee Club volunteers Stephanie and Steven D’Amico pose for a picture with “Hope,” the inflatable manatee.